An accurately turned sphere is the basis of many of the projects in my book. Thinking about turning spheres is far more worrying than actually making them, so let's begin. 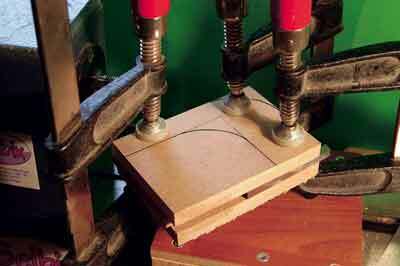 There are two methods described in my book; this one uses a sphere-turning jig. 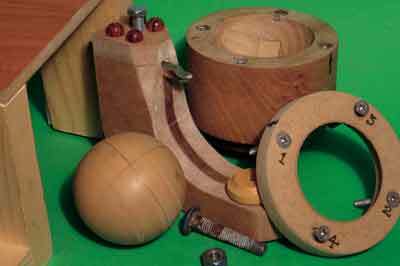 This basic sphere-turning jig can be made in an ordinary workshop using simple tools and readily available materials. The simple version shown here will function very well, but once you understand its principles you may see ways to adapt it in order to fit different lathes and produce larger or smaller spheres. It could be made in a more sophisticated manner with more refined materials; the choice is yours. 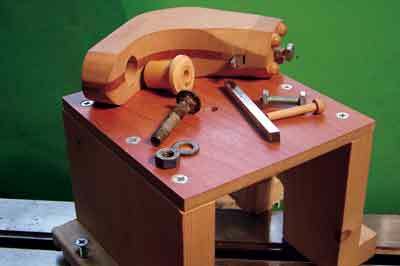 As you can see from the various photographs of this jig, the rotating arm which holds the cutting tool sits upon a wooden 'saddle' fitted over the lathe bed. 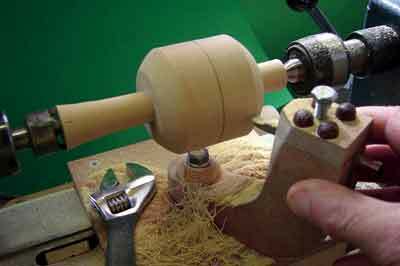 This saddle is screwed firmly to the bench to which the lathe itself is fixed. Build the wooden saddle first. Its construction and size depend upon the lathe you have. 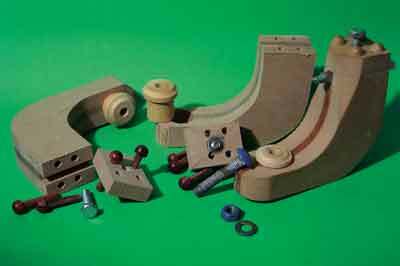 It must provide a flat, firm and stable base which is parallel to the lathe bed and perfectly level. You must make provision to screw or fix the saddle in some manner to the bench upon which the lathe sits. The height of the saddle top depends upon the size of the sphere you will be turning. I suggest that for a 62mm diameter sphere, the top of the saddle should be about 80mm (3 1/8in) from the centre of revolution. The rotating arm is laminated from two pieces of 12mm (1/2in) thick MDF and a central layer of 6mm (1/4in) thick hardwood. 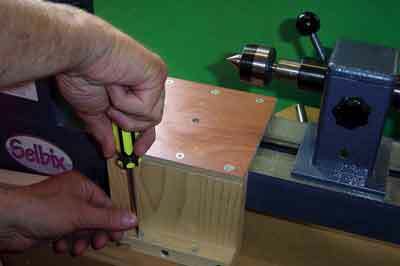 Accurately measure the distance from the top surface of the saddle to the centre height of the lathe; call this height X (step 2). 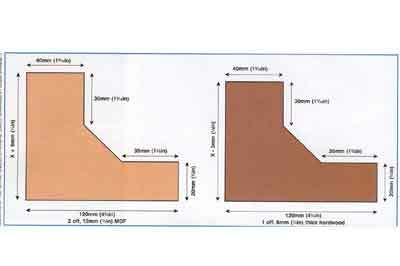 Take the 12mm (1/2in) MDF and mark out the two pieces as shown in steps 3 and 4. The top and base lines are parallel; the height will be X + 6mm (1/4in). 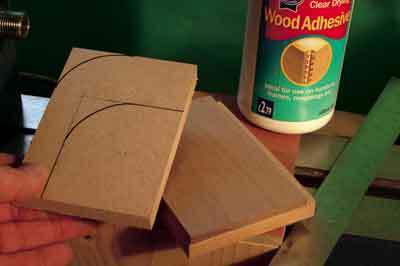 Take the 6mm (1/4in) thick piece of wood and mark it out as in step 4. The top and base lines are parallel, and the height will be X 3mm (1/8in). All pieces for the swinging arm are shown in steps 5 and 6. Carefully glue the three parts together, sandwiching the hardwood piece in the middle so that the base edges all line up perfectly. 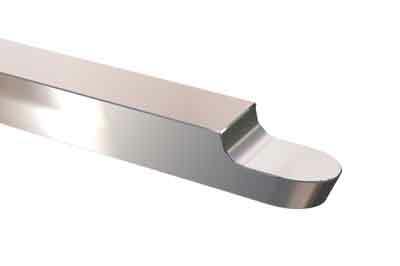 Make sure that the channel formed in the top of the swinging arm is free of glue. Before the glue sets, test the tool bit in the channel and adjust the fit if necessary. Step 7 shows the parts glued together, with the cutting tool in place to check that the fit is exact. Make sure that the top edge of the 6mm (1/4in) central layer is parallel to the base; the tool sits upon it and must not slope up or down. When the glue has dried, remove the cramps, bandsaw the arm to its final shape and clean up (step 8). To mark the position for the point of rotation on the swinging arm, measure 20mm (3/4in) from the front of the piece (step 9) and mark the exact centre of its width (which will fall on the centre of the 6mm (1/4in) thick middle part of the laminate). Using a 20mm (3/4in) drill bit, drill vertically through this marked centre. 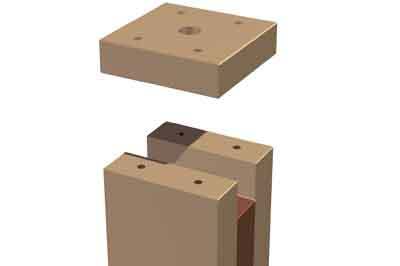 For the cap which secures the tool in position, cut a piece of 12mm (1/2in) thick MDF, 30 x 40mm. Pencil in the diagonals on the top to locate the centre (step 10). Take a 6mm (1/4in) nut and bolt, 40mm (19/16in) long, and drill a hole at the marked centre to accept the nut so that it sits flush with the surface. Then drill the rest of the way through the marked centre using a 6 mm (1/4in) bit. Clean up, and glue the nut into the hollow using epoxy resin. Make sure that the hole through the nut and the MDF remains open. 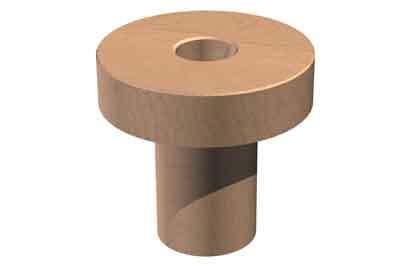 Turn four wood 'rivets', 6mm (1/4in) in diameter with a 9mm (3/8in) cap. These should be 33mm (15/16in) long. The rivets will be glued in place to hold the top securely; screws will not hold sufficiently well in MDF. Mark the rivet positions on the cap as shown in step 10. Drill through the marked centres using a 6mm (1/4in) drill. Hold the cap on the top of the rotating arm with the inset nut facing down and, using one of the drilled holes as a guide, drill through into the top of the rotating arm. Push one of the wooden rivets partially into the hole before drilling the next hole and inserting a second rivet. Repeat this process at the third and fourth holes (step 11). Try the tool bit in place and gently lock it down using the bolt through the centre hole. Adjust to make sure firm contact is made with the tool. When satisfied, remove the bolt and carefully glue the rivets in place, making sure there is good glue contact between the rivets and the holes in the top of the rotating arm. 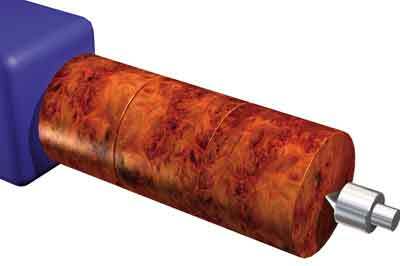 Make sure that the channel in which the tool sits is cleared of any squeezed-out glue. Leave to dry. Turn a plug to fit the hole in the rotating arm, as shown in step 14. This plug must fit the hole precisely without any play. It should be a fraction longer than the depth of the hole, so that when it is locked down the surrounding arm is still free to rotate. 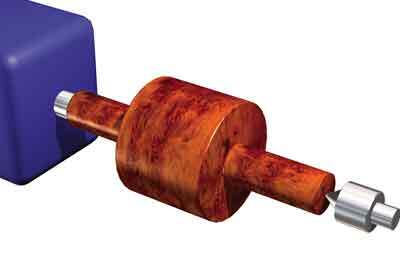 Apply candle wax to this plug to act as a lubricant. 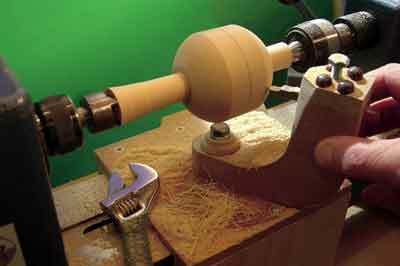 Set the saddle on the lathe. Place the centre in the headstock and, placing a try square on top of the saddle with its blade held upright, mark vertically down from that point to the top of the saddle. Place a centre in the tailstock and repeat the procedure. Join the two points with a pencil line. Mark a position halfway along that line, and drill a hole through to accept the coach bolt. 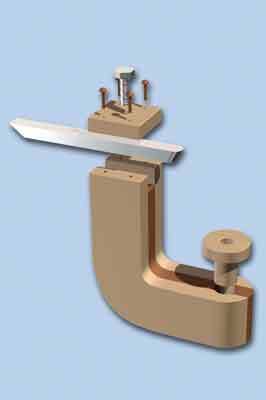 When the coach bolt is first tightened, the square section beneath the curved cap is drawn into the wood, locking the bolt in place. Finally, clean up the whole jig and polish. Step 12 shows all the parts of the jig. 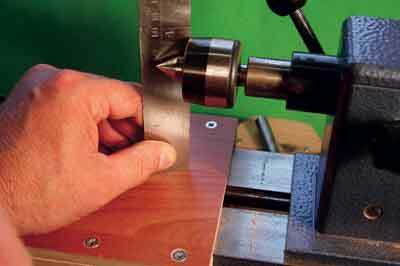 Once the jig is assembled, the tool has to be ground so that the cutting edge is precisely at lathe-centre height; grind the tool as illustrated in step 13. 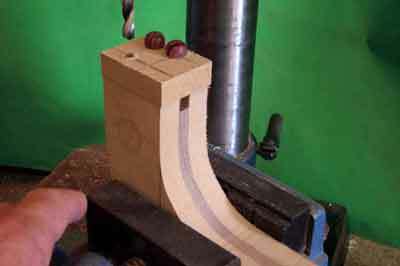 The blank is turned, between centres, to exact diameter and width, with the centre line of the blank located exactly above the centre of rotation of the jig. When using the sphere-turning jig, apply light pressure on top of the rotating arm to prevent bounce and chatter. Turn the block between centres as shown in steps 15 and 16, to produce a cylinder of 62mm diameter with spigots at either end and a marked centre line. Switch off the lathe. Set up the jig so that the top of the tool is exactly at lathe-centre height, and both the front middle tip of the tool and the pivot point of the jig are exactly in line with the centre line around the blank (step 17). 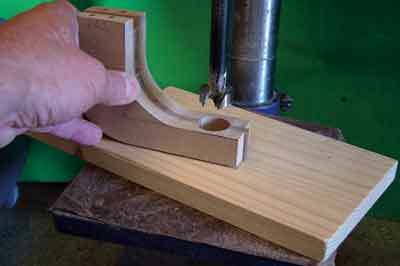 Swing the jig to the right and move the tool forward so that it just touches the corner of the block. Check the left side in the same way, then lock it down firmly. Bring the jig back to the central position and switch on the lathe. 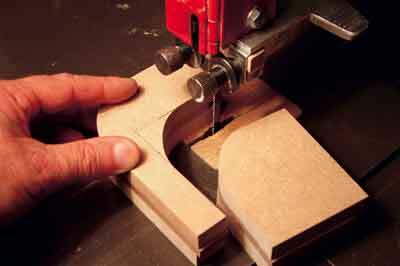 Applying slight pressure to the top of the jig, slowly swing it to the right, cutting a small amount from the corner of the block (step 18). Repeat this procedure on the left, then return to the centre. 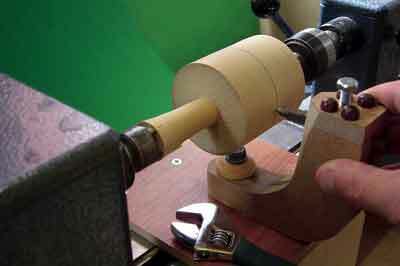 Turn off the lathe, and adjust the tool so that it will cut a fraction deeper on the next pass. Repeat the cutting process as many times as necessary, swinging right, then left and back to centre, always turning off the lathe before readjusting the tool for the next cut (step 19). Each cut should be reasonably light. The final cut is made so close to the drawn centre line that it almost touches it. Do not cut any wood from the centre line (step 20). 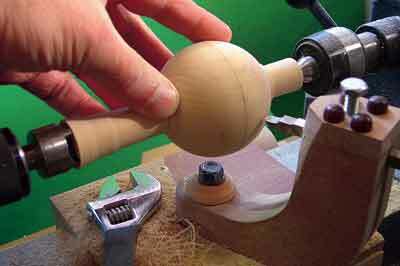 Once the final cut has been made, turn off the lathe, remove the jig and sand up the part-turned sphere. Cut short the stubs at either end, leaving 6mm (1/4in). Now set the part-turned sphere aside. Mount the second piece of wood, 90mm diameter by 56mm thick, on a faceplate and turn it to a finished size of 85mm diameter by 50mm (2in) thick. Turn a hole 35mm in diameter and 18mm deep into the centre of the face. Chamfer the edges of the hole with a good 45 degree cut. Turn away the outer edge, sloping back towards the faceplate, but do not disturb the turned chamfer, which will support the part-turned sphere. Take the third piece, 33mm diameter by 20mm thick, and turn it to 30mm diameter by about 18mm thick, with a central hollow at one end into which the revolving centre will fit, and a curved hollow at the other, to match the curvature of the sphere. With the faceplate still mounted at the headstock and a revolving centre fitted into the tailstock, place the part-turned sphere into the chamfered hollow on the faceplate (step 21). A little adhesive putty spread inside the small turned cup will help it seat firmly against the sphere. The small turned cup, supported by the revolving centre, is then brought up against the other side of the part-turned sphere. Ideally the two small stubs should be at 90° to the axis of rotation; at any event they must be positioned in the central exposed portion between the two supports, so there is plenty of access for them to be turned away. Bring the toolrest across and rotate the work by hand to make sure that nothing catches. 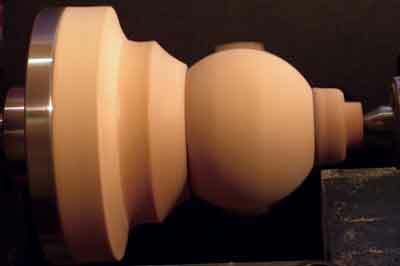 When the lathe is switched on, the two stubs will show as 'ghost' images, while the spherical surface will appear solid (step 22). Cautiously bring the gouge into contact with the 'ghost'and turn it away, leaving the outer surface of the sphere untouched. If the sphere has not been turned true, there will be a ghosting of the untrue area, which can then be turned away, producing a truly spherical shape. This completes the first method. 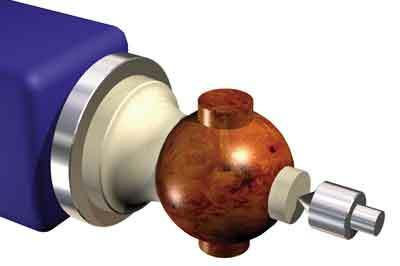 Complete as before, by holding the sphere between the faceplate hollow and the tailstock cup, turning away the ghost images of the stubs until a true sphere remains (step 23).